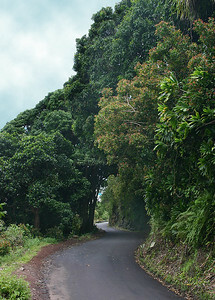 A typical stretch of the Hana Highway beyond Kailua. A roadcut for the narrow (often no more than one lane wide) rural highway can be seen in the upper-left quadrant of the photo. Rainfall averages are often more than 200 to 300 inches a year; however, this part of the island got that much in 2.5 months during the winter of 2006! 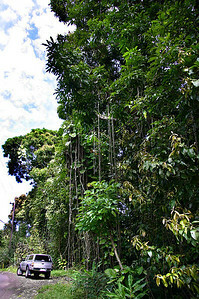 A narrow stretch of the Hana Highway cuts right through the rainforest canopy. 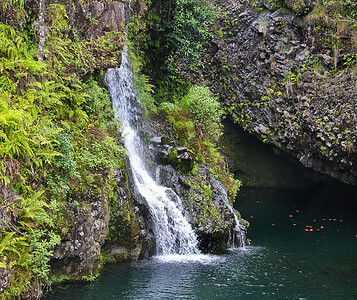 Hanawi Stream Falls -- The mouth of the stream empties into Waiohui Bay, just up the coast from the beach at Lower Nahiku, east Maui. 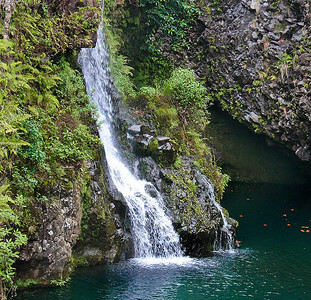 Close-up of the Hanawi Stream waterfall, on the Hana Highway near Nahiku, east Maui. 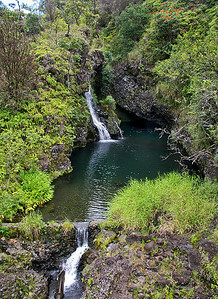 Close-up of the Hanawi Stream waterfall and pond, near Nahiku on the Hana HIghway, east Maui. 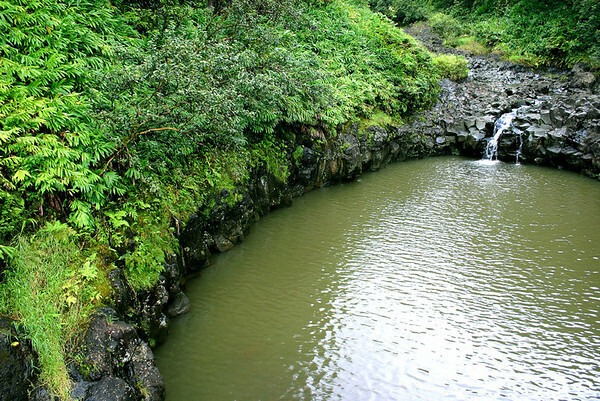 A runoff pool, the Hana Highway. 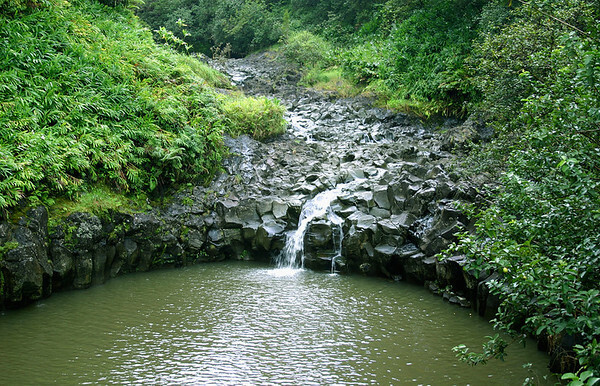 A runoff pond carved into the basalt of a hillside near Kaumahina Wayside Park, Maui. 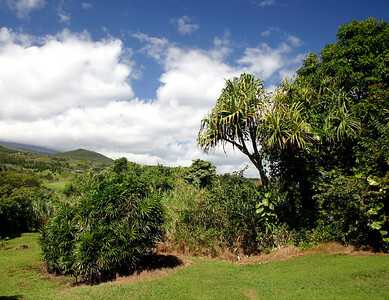 A typical scene at the Hana Maui Botanical Garden, Ulaina Road outside of Hana, east Maui. 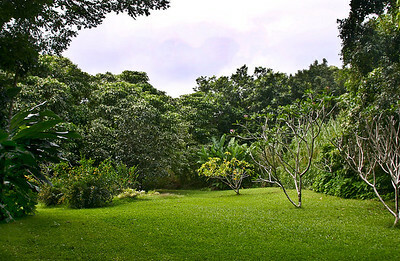 A typical view of the grounds of the Hana Maui Botanical Gardens on Ulaino Road in Hana, east Maui. 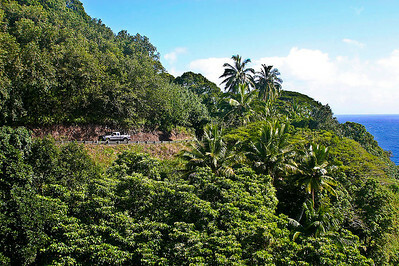 Situated within the Ko'olau coastal rain forest preserve, the "gardens" give the appearance of natural growth and conditions. Grass-covered footpaths let the visitor wander freely through the grounds. The copious rainfall of the area (more than 100 inches a year) and the landowner's benign neglect allow the various species of trees, bushes, shrubs, and flowering plants to experience natural growth cycles with only a little human intervention on their behalf. 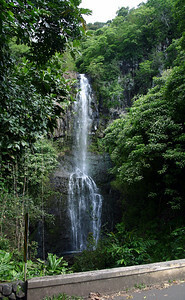 Wailua Falls, seen from the bridge over Wailua Gulch, west of Oheo Gulch, east Maui. The Hana Highway near Wailua Cove and Kuloa, east Maui. Here on the easternmost tip of Maui the roadbed is cut into the sheer faces of cliffs that plunge hundreds of feet straight down to the ocean. 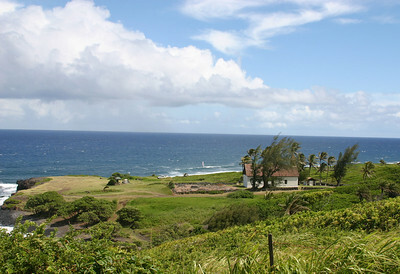 Hui Aloha Church and graveyard, west of Oheo Gulch in east Maui. Note the insanely brave windsurfer just offshore near center of photo. Also note the palm trees bent over by the strong prevailing winds on this isolated point of land. 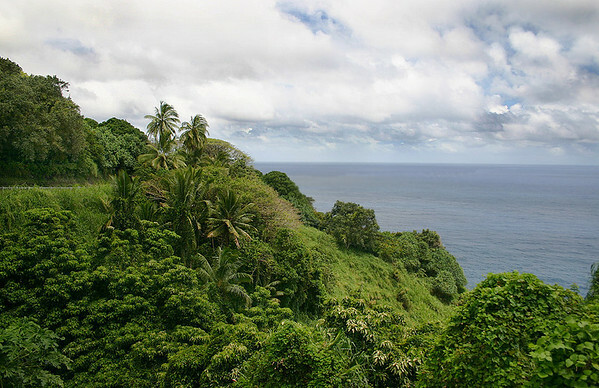 The Lower Nahiku Road runs through the thickest part of the rain forest as it winds its way down to the shoreline. Nahiku, east Maui. 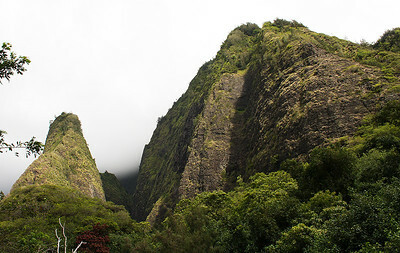 The Needle, Iao Valley, West Maui Mountains, Maui. 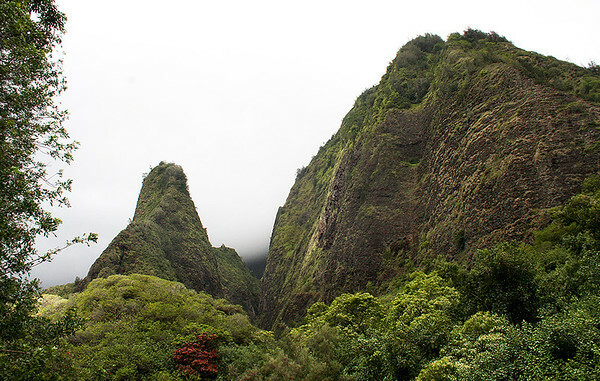 The valley holds a great deal of religious, cultural, and historical significance for native hawaiians. 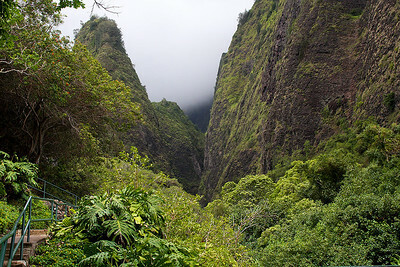 Before white settlement, Iao Valley was the site of the Makahiki (literally "the rising of the constellation the Pleiades"), a four-month-long harvest festival held in honor of Lono, the god of fertility and peace. During the festival, all fighting ceased; feasting, athletic competitions, and joyful debauchery prevailed. It is said that, even to this day, processions of long-dead royalty marching to ghostly drumbeats are seen at the old Makahiki sites. In the 1980s, native hawaiian groups revived the observance of Makahiki to encourage the renewal of traditional traditions. 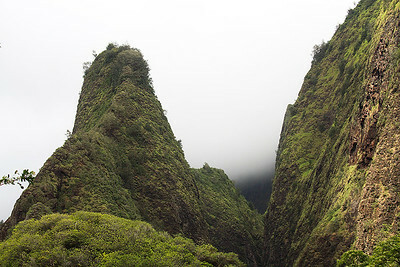 "The Needle", 'Iao Valley, windward Maui. 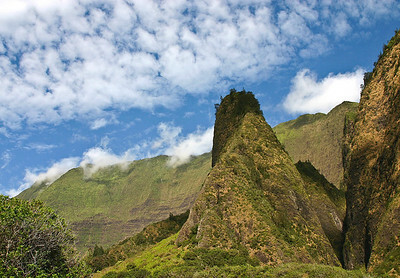 Looking at the cleft between the wall rocks of the West Maui Mountains caldera and the spire of the 'Iao Needle. 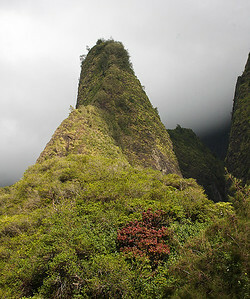 Closeup of the 'Iao Needle, showing the heavy rainforest vegetation growing on the steep faces of the basalt pinnacle. 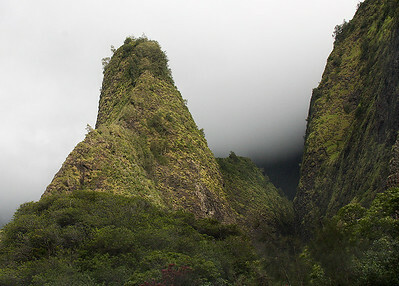 The Needle (left) faces the remnants of the wall rocks of the West Maui Mountains caldera. The Needle is a remnant of the floor of the caldera. 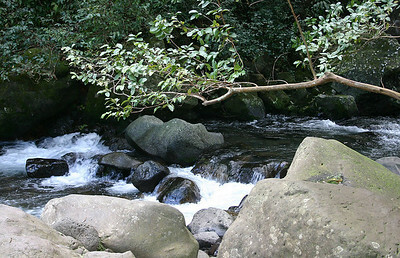 Iao Stream in the West Maui Mountains. As part of his campaign to unite all the islands, in 1790, King Kamehameha I attacked Kahului village, driving the defenders up into the steepest parts of the valley. They were mercilessly slaughtered at a place called Kepaniwai ("the Damming of the Waters"), where the bodies of the fallen choked the Iao Stream, causing its waters to run red with their blood. 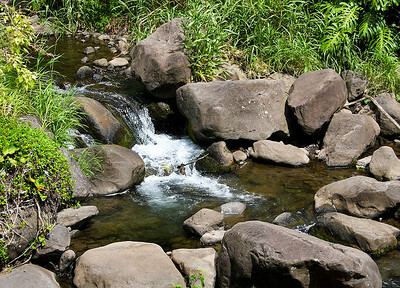 The stream that runs along the floor of the 'Iao Valley is choked with rubble from the erosion of the volcanic rocks of the floor and walls of the West Maui Mountains caldera.